The Highland boys’ basketball team overcame a 16-point deficit to take a fourth quarter lead over Northmor, but the Knights were able to rally in the final minute to pull off a 56-52 win on the road Friday night. The first quarter of the game was evenly contested, with neither squad able to claim the momentum. The Knights took a 6-2 lead thanks to a pair of shots from Blake Miller, but Highland came back with a 10-3 run sparked by Mack Anglin’s five markers. Trailing 12-9 with 3:27 left in the quarter, Northmor’s defense took over, holding the Scots scoreless for that duration. Northmor got a bucket from Demetrius Johnson and Miller added two more successful shots to give the visitors a 15-12 lead in front of a loud and enthusiastic crowd. 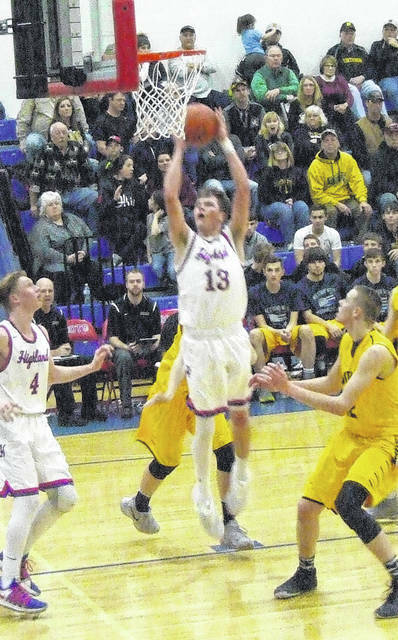 Northmor took their momentum from the end of the first period into the second, scoring eight of the first 10 points — four by Tyler Kegley — to increase their lead to a 23-14 margin. Highland struggled offensively throughout the quarter and trailed 33-19 at the half. The Knights widened their lead to a 37-21 margin early in the third quarter, but when Johnson picked up a third foul and had to sit for much of the period, things started to turn in favor of the Scots. Highland held their guests scoreless for over three minutes, going on a 12-0 run during that span. Kaleb Miller dropped in five of those points, while Anglin added a basket and free throw. A 4-2 run by the Knights boosted their lead back to six at 41-35, but the Scots finished the quarter with two straight baskets from Andrew Wheeler to only trail by two. Powell was impressed by how his team battled back from a large deficit to get back into the game. Highland continued to fight back in the fourth. Trailing 45-41, the team got a free throw from Phillips and a basket from Anglin to close within one. Northmor got a foul shot from Johnson, but the Scots then hit four straight from the line to take a 48-46 advantage with 4:49 to play. Both teams traded baskets over the next few minutes, but with his team trailing 52-50 in the final minute, Brock Pletcher drained a three-pointer to put his team back in front by one with 33 seconds remaining. The Knight defense then put the finishing touches on the narrow win, forcing turnovers on both of Highland’s final two possessions. Pletcher and Tyler Kegley combined for three free throws down the stretch to provide their team’s final points. Northmor got 16 points from Miller, while both Pletcher and Tyler Kegley had 10 and Johnson and Kyle Kegley both finished with nine. For the Scots, Wheeler scored 16, Chris Branham added 14 and Anglin scored 13. After the contest, Ruth was happy to win another game over a Highland team that he noted brought a strong challenge. 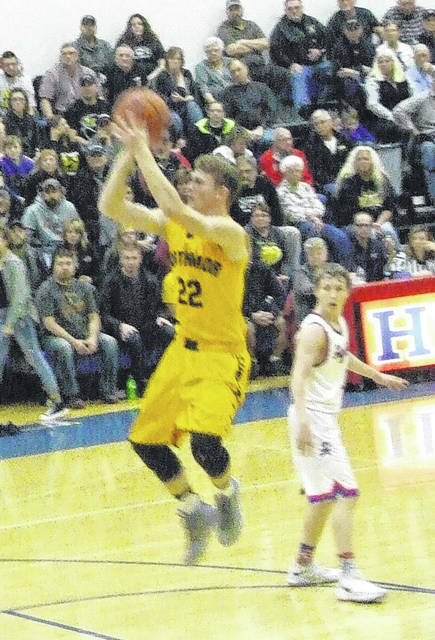 Northmor’s Brock Pletcher hit the game-winning shot late in the fourth quarter of his team’s closely-contested battle at Highland Friday. Highland’s Mack Anglin works inside for two points against Northmor Friday.